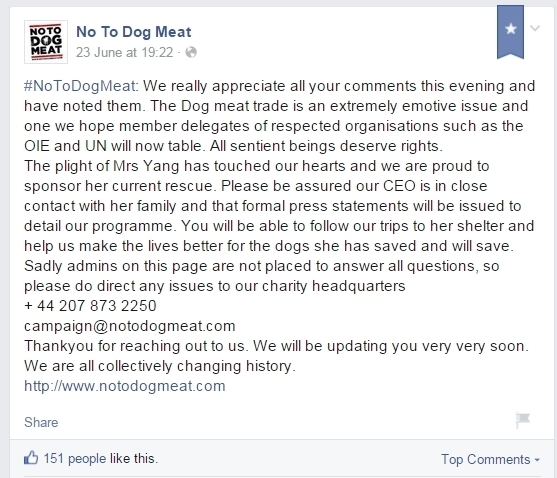 I think NTDM have acted very badly with regards to the money raised for Mrs Yang. As for the ‘rescuer’ herself, I think she is in way over her head and mistrusting to the point that she is harming the dogs themselves. Nowhere do I see a rescue mission, just dirty, neglected dogs living in squalor. Im sure Mrs Yang has a good heart but like any other hoarder she is putting her own personal agenda to the fore and is NOT providing a sanctuary for these dogs. I don’t think either party has come out well in this investigation as NTDM should have offered the money back to the donors or come up with another plan to get the money to where it is needed. There are many genuine and responsible rescues in China who could do wonders with that money. What we don’t see here is any attempt to use those substantial funds for what they were intended. Personally I would like to see NTDM and Mrs Yang investigated thoroughly.